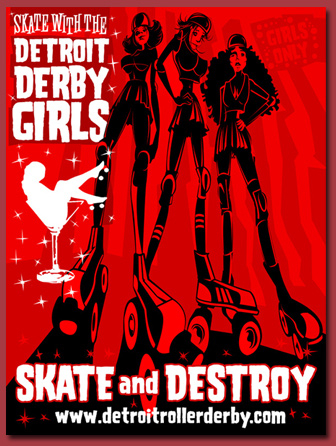 A few weeks ago i was lucky enough to see the first game of the Detroit Derby girls 2007/08 season. Just wanted to say i had the time of my life, will be back, and can't think of a place where you can have such a fun night out for so little money. The next bout will be the Devil's Night Dames vs, the Pistol Wippers on Saturday, November 10, at the Masonic Temple Drill Hall. Advance tickets are recommended; available at Meijer stores and Danny's Pub in Ferndale along with other locations listed on the Detroit Derby Girls website. When i was younger roller derby was my favorite sport after wrestling - for a time it was my favorite. The revival of derby in the form of skater-owned flat track clubs has brought it back with a DIT grassroots twist. To find out if there's a league in tour area, check out the Women's Flat Track Derby Association!